Austrian Defence Minister Hans Peter Doskozil set the stage for a realignment of airspace surveillance by the Austrian Armed Forces: On the basis of the report by the 26-member special commission "Active Airspace Surveillance", 100 percent of the monitoring mission for Austria&apos;s airspace is to be performed by a single-fleet system, deploying a fleet of 15 single-seat and 3 double-seat supersonic jets. From 2020 onward, the Armed Forces will gradually phase out operations with the 15 Tranche 1 Eurofighter Typhoon aircraft now in use, with their limited equipment and significant cost uncertainty. The transition to a supersonic fleet with unlimited capabilities for day and night flying will begin as of 2020. Austrian airspace is currently monitored under a two-fleet system using supersonic Tranche 1 Eurofighter Typhoons complemented by the subsonic Saab 105OE. Now nearing the end of its service life, the Saab 105OE would be due for replacement from 2020 onward. The switch to an alternative one-fleet system will be better both in terms of military effectiveness and cost as compared with the planned deployment of the Saab 105OE and the continued operation of the 15 single-seat Tranche 1 Eurofighter Typhoons as currently equipped. For the operation of the 15 Eurofighters alone, with their inferior equipment as compared with alternative fleets, the Austrian Armed Forces would have faced total costs of between 4.4 and 5.1 billion euros over the next 30 years. That does not yet take into account the specific cost risk of Tranche 1 or the costs for deploying the Saab 105. Doskozil: "A yes to neutrality must be followed by a yes to supersonic aircraft"
Defence Minister Hans Peter Doskozil: "Those who say yes to Austrian neutrality and sovereignty must also say yes to modern, high-performance supersonic aircraft capable of round-the-clock operations. At the same time, we need to get the escalating costs of the Eurofighter under control and minimise the enormous cost risks associated with it - in the interests of the taxpayer and also in relation to the other branches of the armed forces. I will therefore instruct the general staff of the Austrian Armed Forces to begin immediately with all preparations for a transition from the current two-fleet system, which is militarily ineffective and very costly, to a more cost-effective one-fleet system with stronger military capabilities. This decision is based on clear findings of the special commission &apos;Active Airspace Surveillance&apos;." From the standpoint of military effectiveness and security strategy, the report by the special commission "Active Airspace Surveillance", headed by Brigadier Karl Gruber, the commander of the Austrian Air Force, recommends supersonic aircraft with unrestricted operational capabilities both by day and night, the establishment of response capability in case of unauthorised incursions by uncooperative fighter aircraft by equipping the interceptors with an advanced self-defence system and guided missiles with all-weather capabilities, and 100 percent airspace monitoring coverage through supersonic aircraft. On that basis it thus advises a transition from the current "two-fleet system" (15 Eurofighter Typhoons / Saab 105OE) to a single armed fleet with 15 single-seat and 3 double-seat jets stationed at two airbases starting in 2020. According to figures prepared by the special commission, the savings in the period up to 2049 as compared with the currently planned procurement of a successor system for the Saab 105OE and the continued operation of the 15 Tranche 1 Eurofighter Typhoons will range from approximately 100 million to 2 billion euros, depending on the option chosen for the new alternative fleet. Doskozil concluded: "The debate on Austrian airspace surveillance has been dominated for years by the budgetary burdens associated with the operation of the Eurofighter. Too little attention has been paid to military considerations and security scenarios for the credible preservation of our neutrality and sovereignty. Now both are guaranteed: The new concept for the active monitoring of our airspace is both cheaper and more militarily effective than the continuation of the status quo. It will save taxpayers&apos; money and enable us to monitor Austria&apos;s airspace both by day and night." The special commission "Active Airspace Surveillance"
The suspicions surrounding the procurement of the Eurofighter Typhoon aircraft under the purchase agreement from July 2003 and the reduction in the number of aircraft to be delivered through the so-called settlement in 2007 resulted in the launch of internal investigations in the sphere of activity of the Ministry of National Defence and Sport in 2013. When these investigations were intensified in 2016, evidence was found showing that the Republic of Austria had been the victim of fraudulent deception at the time of the purchase decision and the signing of the contract in 2003 and after agreeing to the settlement in 2007. The criminal complaint filed against Airbus Defence and Space GmbH and Eurofighter Jagdflugzeuge GmbH with the Vienna Office of Public Prosecutions in February 2017 was coupled with the order from the Federal Minister of Defence, Hans Peter Doskozil (pursuant to the ministerial order No. 253/2017 of 2 March 2017) instructing the Austrian Armed Forces to establish a special commission headed by Brigadier Karl Gruber to evaluate options for effective active airspace surveillance and to submit recommendations on that basis by 30 June 2017. 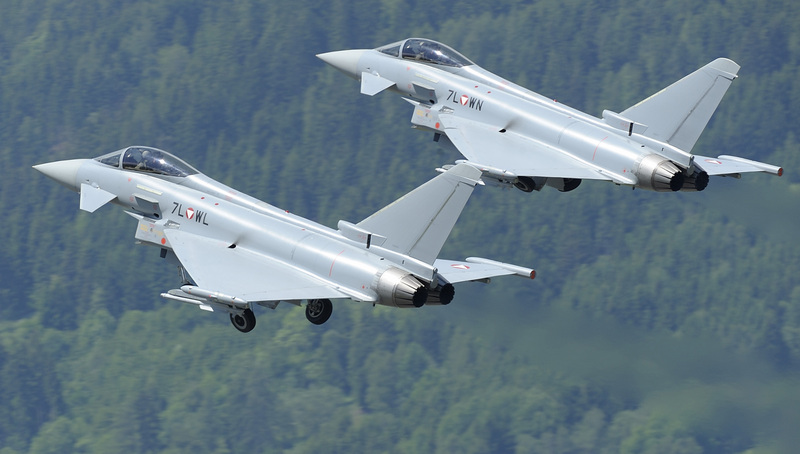 Operations with Austrian Eurofighter aircraft are to be phased out. 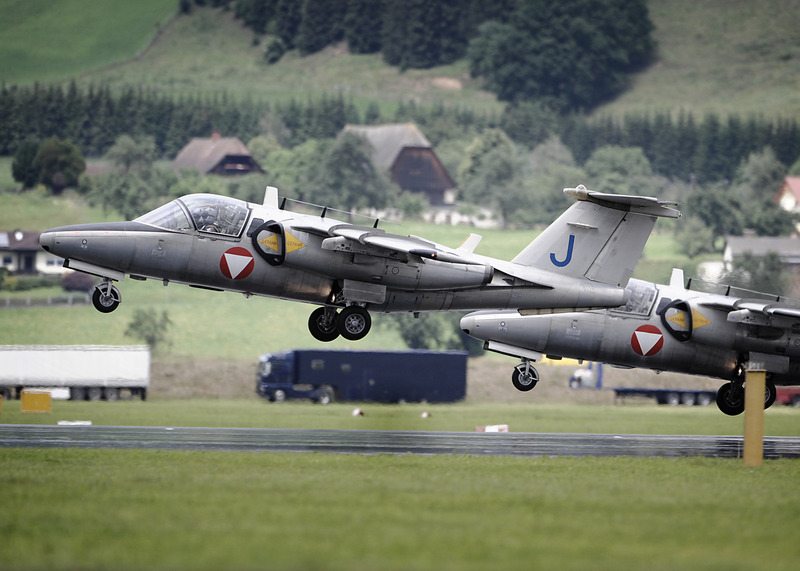 Airspace surveillance is currently complemented by the subsonic Saab 105OE.